WORK is due to start later this month on iconic projects in the regeneration of Ardrossan and Saltcoats, Irvine Bay Regeneration Company announced this week. Local contractors McLaughlin Construction of Irvine will go on site from 26 October at the former Jack Miller Hotel and Saltcoats station building. The work is being undertaken after funding of almost £1.5 million was secured from the Scottish Government’s Town Centre Regeneration Fund. The Government fund is making £60m available to projects across Scotland this year. 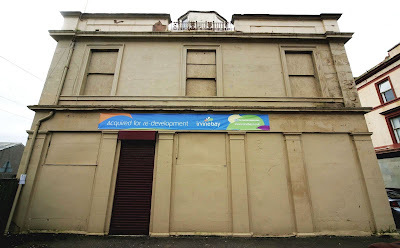 The former Jack Miller Hotel building in Ardrossan (pictured above) will provide office accommodation for businesses in the area. Irvine Bay hopes to provide financial support, as part of a larger private investment, to refurbish the Harbour Bar and bring it back into use as a restaurant and bar to support the developments at the marina. 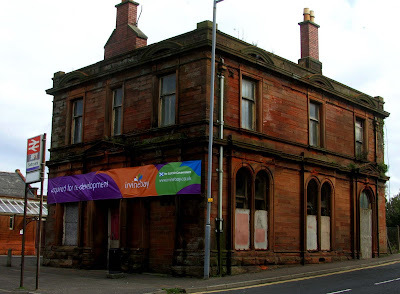 In Saltcoats, the former station building (pictured below) will be redeveloped to provide retail space or office space and also a restaurant. Irvine Bay Regeneration Company seeks to develop and revitalise the five towns of Ardrossan, Saltcoats, Stevenston, Kilwinning and Irvine in North Ayrshire through a £100 million, ten year programme to boost the local economy and make the area an attractive and prosperous place to live, work and to visit. Partners are North Ayrshire Council, Scottish Enterprise and the Scottish Government. There are currently 604 Ayrshire business stories permanently archived on this site. To locate those of most interest to you, please use the site search facility in the top left hand corner of this page. Type your search term in the white box, then click “SEARCH BLOG”.